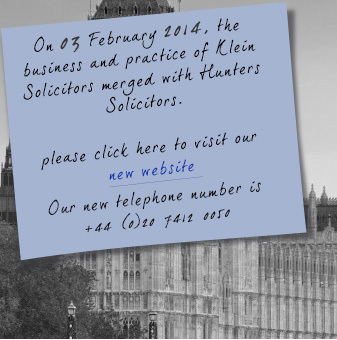 Klein Solicitors are a successful, dynamic and independent legal boutique located in Mayfair in the West End of London. We consistently provide the highest standards of legal excellence, experience and expertise normally associated with large commercial law firms but combined with a personalised, client focused and accessible service that provides value for money to our international and UK client base. Our experienced team of lawyers undertakes both transactional and dispute resolution work (much of it international) for corporate, institutional and private clients across a range of core practice areas and industry sectors based on an in-depth understanding of their businesses, objectives and legal requirements. © Copyright 2011 Klein Solicitors. All rights reserved.